The Northern Territory Parliament consists of one chamber: the Legislative Assembly. There are currently 25 Members of the Legislative Assembly (MLAs), each from a single electoral division. Members of the Legislative Assembly are elected using a preferential voting system for a term of up to four years. Voting in Northern Territory Legislative Assembly elections is open to all Northern Territory citizens aged 18 years or over. The first European settlement in northern Australia started in 1824 when what is now the Northern Territory was part of the Colony of New South Wales. In 1863, the Northern Territory became part of the Colony of South Australia and from January 1911, the Northern Territory was the responsibility of the Commonwealth. The first Legislative Council of the Northern Territory was appointed in December 1947. There were 13 members, seven of whom were official members, mainly the heads of Australian Government departments. The remaining six were elected by the public. The head of the Legislative Council was the Commonwealth-appointed Administrator of the Northern Territory. In 1974, the Legislative Council was replaced by a fully elected Legislative Assembly with 19 members, which was increased to 25 in 1982. In 1978, the Northern Territory was granted limited self-government by an Act of the Australian Parliament. Areas such as Aboriginal land, uranium mining, and industrial relations continue to be managed by the federal government. However, the Northern Territory operates as a state for financial dealings between the State and Federal governments. The colours of the Northern Territory are those of its flag: black, white and ochre. The Northern Territory was given its own Coat of Arms in 1978. It shows two red kangaroos supporting a shield that displays Aboriginal items associated with Arnhem Land. The crest is a wedge-tailed eagle. The Northern Territory flag was first flown in 1978. Its design uses the black, white and ochre colours found in Aboriginal painting. The flag shows Sturt's desert rose, the official flower of the Northern Territory, and the Southern Cross. 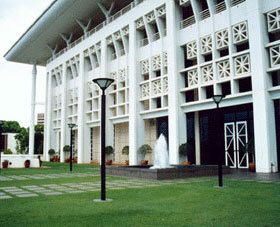 The Northern Territory Parliament House was opened in August 1994. It is Australia's newest parliamentary building. The Parliament House is located in State Square, the administrative centre of Northern Territory law and government. In 1974, Sturt's desert rose was made the official Flower Emblem of the Northern Territory. The red kangaroo is the official Animal Emblem of the Northern Territory. The wedge-tailed eagle is the official Bird Emblem of the Northern Territory. Equal electorates As at 1998 electorates can vary by 20%. The Northern Territory is represented at the federal level by two Senators, elected for up to three years. The Administrator of the Northern Territory, its ´Head of State´, is appointed by the Governor-General as his or her representative in the Northern Territory. Laws made by the Legislative Assembly require the assent of the Administrator. The leader of the government in the Northern Territory is known as the Chief Minister.